Temecula Valley vintners and growers, they are finding that less water is producing a smaller crop with more concentrated sugar and more complex flavor. Grapevines thrive in less-than-desirable conditions. "We are in a new era of grape growing, and water will always be part of the equation." It was predicted to be an epic weather event of almost historic proportions but the highly anticipated El Niño of Winter 2015-2016 failed to materialize in Southern California Wine Country. According to the National Weather Service Climate Prediction Center, the threat of El Niño has now past. However, they do expect “La Niña” to influence our weather this summer through winter, which means warmer temperatures and less rainfall than normal. Though not exactly music to the ears of local vintners and growers, they are finding that less water is producing a smaller crop with more concentrated sugar and more complex flavor. Grapevines thrive in less-than-desirable conditions. Their roots reach deep to find water. 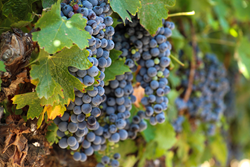 In fact, according to the University of California Drought Management program, “In the production of wine grapes, it has long been recognized that water deficits can lead to improved fruit quality--especially in red wine varieties,” the hallmark of Temecula Valley Wine Country. According to local vineyard owner and winemaker David Bradley of Vindemia Winery, “To grow grapes in Temecula Valley, we need snow in Colorado,” which, in turn feeds the Colorado River, one of the Southwest’s main water sources. Recent snowstorms give hope for what could be a very dry period ahead for Temecula Valley Wine Country. Bradley says that, with so many warm winters over the past few years, budbreak occurs earlier and harvest now begins in July and August, rather than the traditional September start. Gus Vizgirda, Winemaker at Wilson Creek Winery, has been crafting wines and tending vines in the valley for decades and has kept meticulous records, including rainfall totals, daily high and low temperatures, grape tonnage and harvest times. He’s observed that, over the last 10 years or so, as harvest time has gotten earlier, the length of the crucial growing season has become shorter. Other growers and winemakers have noticed a similar pattern and are taking steps to adapt. Last year, for example, local vineyards began to adjust their water usage, when supply was cut by 10% by the Rancho California Water District. Vineyards that didn’t comply faced stiff, and expensive, penalties. “It is important to remember that, while striving to regulate water application, the overall health and well-being of the vine is paramount. Balancing the crop load, vine vigor and water uptake are all important facets of ultimate grape quality. We are in a new era of grape growing, and water will always be part of the equation,” states Jon McPherson, Master Winemaker for South Coast Winery and Carter Estate Winery. One way to conserve water, said Craig Larson, winemaker for Callaway Vineyard & Winery, is “to constantly monitor the vineyards and water the vines for short, more frequent periods, to avoid over stressing the vines. Conditions can change rapidly.” Last harvest, Larson noted, it wasn’t uncommon to make a harvesting decision only to find, a few days later, that the grapes had already begun to dehydrate—something you didn’t see several years ago. El Niño may not have delivered its expected downpours and who knows if La Niña will bring the dry conditions predicted. Whatever nature brings in the coming months, Temecula Valley growers and winemakers will accept the challenge, and continue to craft another stellar vintage. With natural gifts of climate and geography, Temecula Valley is widely recognized for its scenic vineyards, award-winning wines, and friendly wineries as Temecula Valley Southern California Wine Country. The destination includes the Temecula Valley A.V.A. (American Viticulture Area) as well as Downtown, Old Town Temecula, and Pechanga Resort & Casino. Visit Temecula Valley is online at VisitTemeculaValley.com; “TemeculaCVB” on Facebook and @Visit_Temecula on Twitter. The Temecula Valley Visitors Center is located in Old Town Temecula on Mercedes Street adjacent the Old Town Parking Garage. For visitor assistance, call 888/363-2852 or 951/491-6085.